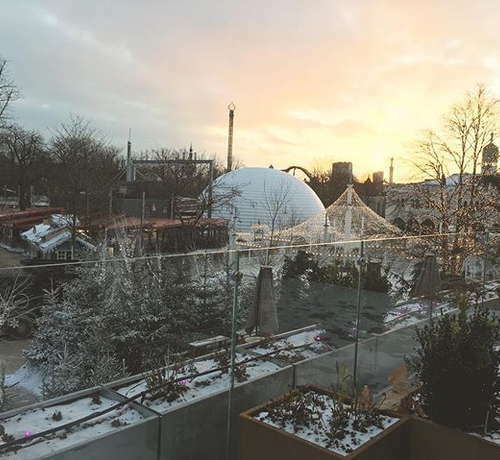 Some hotels are just cool, and the glittering 5* Nimb - the first hotel in Tivoli Gardens - is one of them. Its recent expansion seamlessly blends the original structure, a 100-year old Moorish-palace overlooking the gardens, with a flowing modern building. Historic touches, like the beautiful original doors displayed as art in the staircases, also combine perfectly with modern luxury details, including iPod docks in the individually-designed rooms, and humorous touches, like wall art featuring 3D pug dog heads. But while the hotel knows its hospitality onions, it also knows how to charge. The 38 rooms are all individually designed, with furniture collected from around the world, including some lovely print sofas. Beds are modern four-posters and rooms in the old building even have their own working fireplaces. Bang & Olufsen provide the electronics. Some have huge terraces and balconies, and Suite Louise is probably the most jaw-droppingly lovely suite in town (Take That no doubt agreed after they stayed there). YOU SHOULD KNOW In winter, when Tivoli closes, the gardens undergo maintenance work - although guests have not reported being disturbed by this. All rooms overlook the gardens, apart from the one standard room, which may have some street noise. In summer, Tivoli has live evening music concerts that you can watch from your room. All of the luxe-feeling, large bathrooms have tubs and products from Meraki. There are double sinks, soft lights, and the glass shower doors have etched Arabic-style patterns. The reception of the hotel is small but perfectly formed. Immediately down the stairs behind reception lies the hotel's gorgeous restaurant, Nimb Brasserie, with more stairs to the left leading down past a beautiful mosaic water feature to the hotel's wine bar. A roof terrace and heated open air pool are due to open in summer 2018. The hotel is part of the Nimb mini-chain, named after the original owners. The hotel has two restaurants, Nimb Brasserie and Nimb Bar and Grill, and both are excellent. Nimb Vinotek, downstairs, is a striking enough wine bar but the wow factor really comes from the hotel bar located in Nimb's old ballroom, complete with six-foot fireplace, soaring ceilings and crystal chandeliers. Try the afternoon tea. 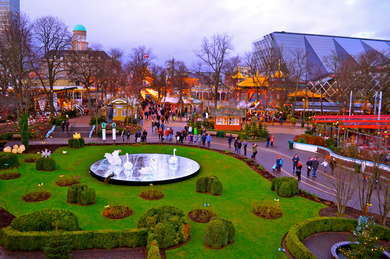 Nimb couldn't be closer to Tivoli, one of Copenhagen's main attractions. It is also walking distance from the shopping street Strøget and the canal. Nyhavn and Kongens Nytorv, and other harborside attractions including the palace, are a further walk - up to 30 minutes - or buses take you there simply enough. Copenhagen Central Station is also nearby. Just across Tivoli Gardens is another Nimb outpost, Grøften (3-minute walk), one of the best spots in town for Danish open sandwiches. Or check out Krebsegaarden (11-minute walk), currently one of Copenhagen's top rated fine dining establishments, where the menu is inspired by the art in the gallery behind the restaurant. Cult bar Mesteren & Lærlingen (11-minute walk) is a must-see on Copenhagen's bar scene. Jailhouse (11-minute walk) is a fun gay bar where the waiters wear police uniforms. Or try Warpigs Brewpub (11-minute walk), a shrine to all things beer. The coolest hotel in town, bar none. From the breathtaking ballroom bar to the handpicked furniture from all over the world, the rooftop pool to the working fireplaces in the rooms, plus the unusual location in Tivoli Gardens, Hotel Nimb is a funky one-off; but beware, prices are accordingly high.